Ryan Welles is back, to review LEGO® Technic 42080 LEGO Technic Forest Harvester which is priced at £119.99 / $149.99 / 129.99€. It is available at Amazon USA. 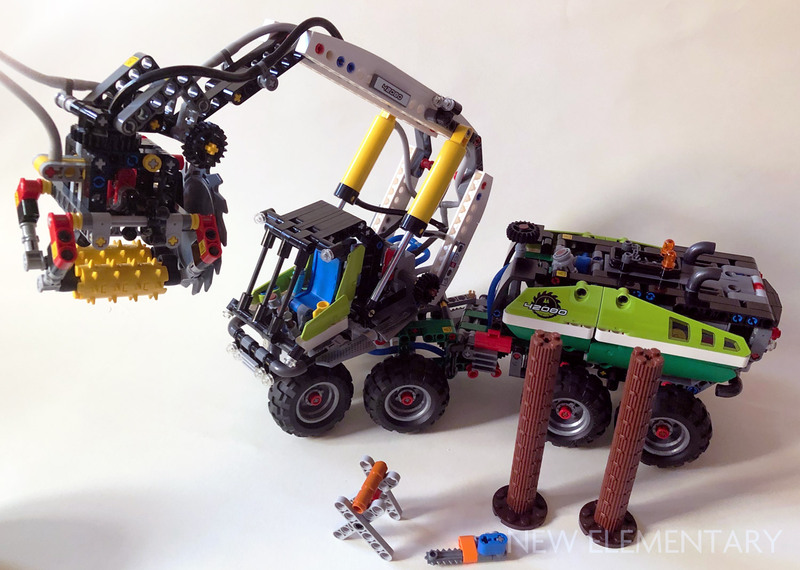 There were times the LEGO® community dreaded the idea that the Technic Pneumatic system might disappear. The golden years of airtanks, valves, compressors and pumps and at least one set a year that contained Pneumatics seemed long gone. This fear grew with the arrival of Power Functions (which was hard to combine with air pressure) and linear actuators (that had functions similar to Pneumatics, more control over movement and a more challenging building experience). Between the years 2006 and 2009 none of the sets released had Pneumatics. In 2010 there was a revival with set 8049 Tractor with Log Loader, without any new parts. But part innovation was just around the corner. 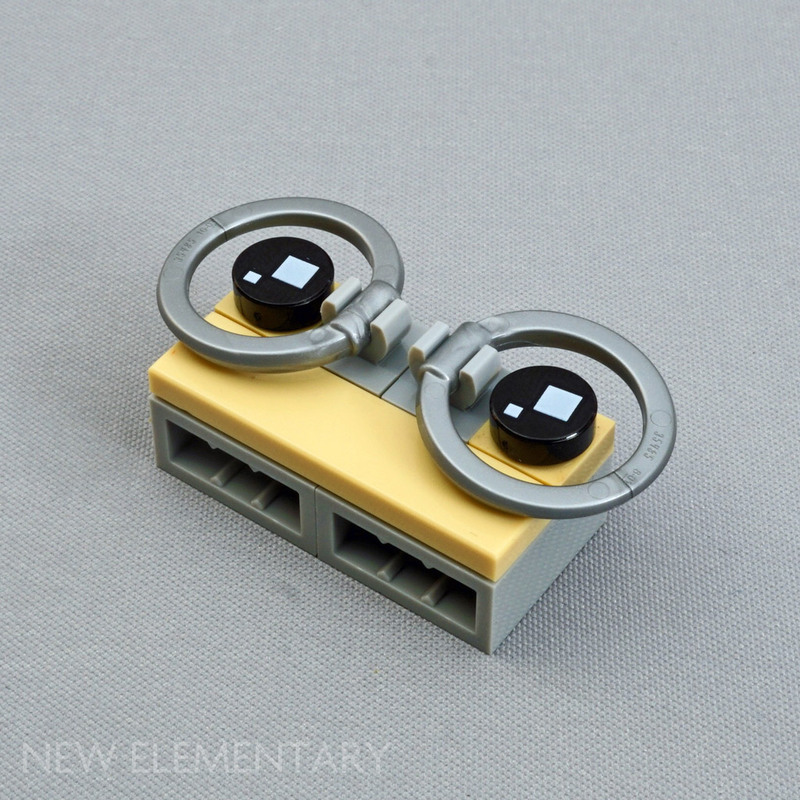 We sent a varied selection of new LEGO® parts to some expert fan builders for them to explore techniques and models to share with you. Here's one from Luc Byard (Flickr). I love Tim; no-one can give you some really awkward LEGO® parts and say ‘build something with those’ quite like he can. The latest bunch included that new minifigure neck bracket with 4 bars (Element ID 6215458 | Design ID 36452) which looks cool… then you try and build with it! 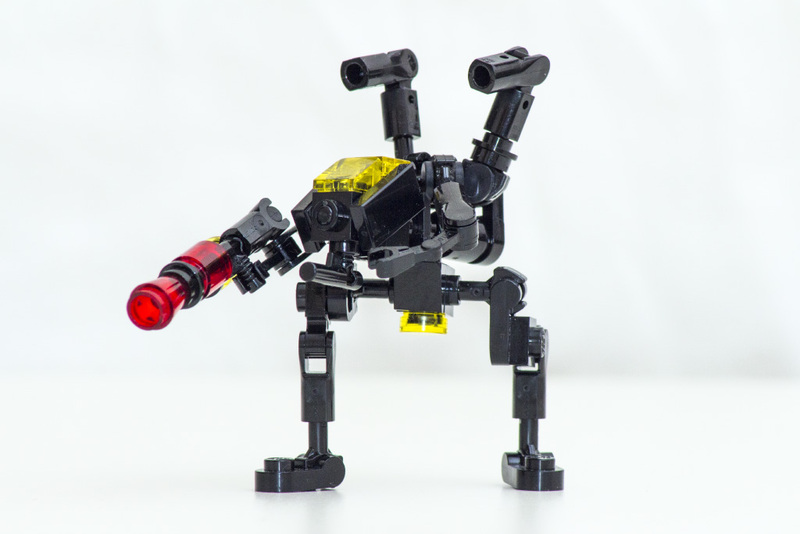 My finished build is a micro Robotech-style walker. And with all that black, I just had to pair it with trans-yellow to give it a Blacktron scheme. 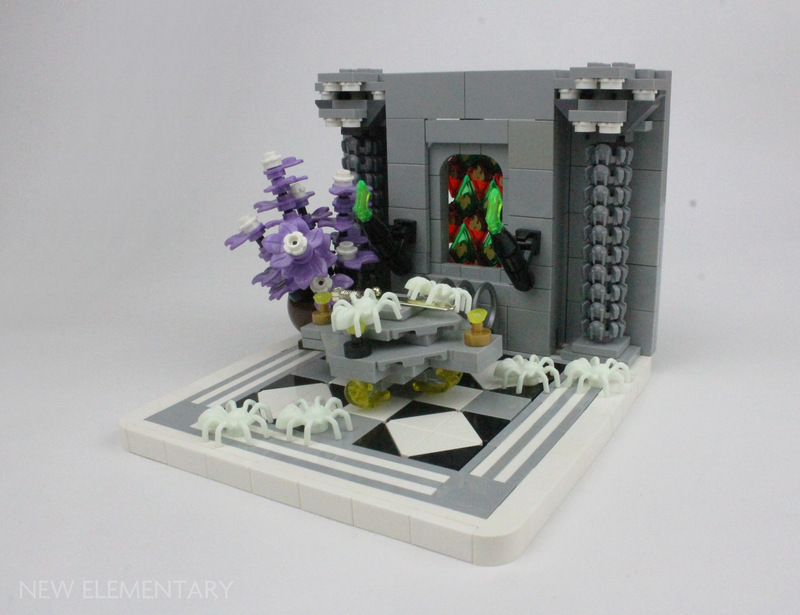 Ralf Langer is a German builder who seems to have a real knack for integrating Modulex into his LEGO® creations. This is the second part in a two-part series; read the first part here. 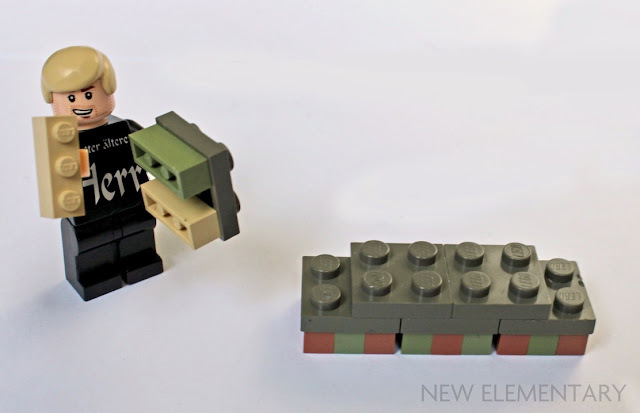 Surprisingly, a Modulex 1x3 brick fits any 2-stud wide LEGO plate (except for the 1x2 plate). Better still, Plate 2x2 allows three Modulex 1x3 bricks to connect, and it fits perfectly. For all plate sizes longer than Plate 2x2, there needs to be gaps as every second Modulex 1x3 brick conflicts with the tubes under the plates. If that's not you want in your model you may prefer to connect multiple 2x2 plates together, as shown above. 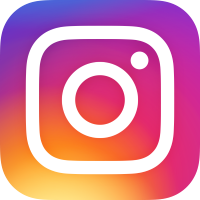 A year ago we published a post by LEGO® history geek Francesco Spreafico about an old LEGO product called Modulex. 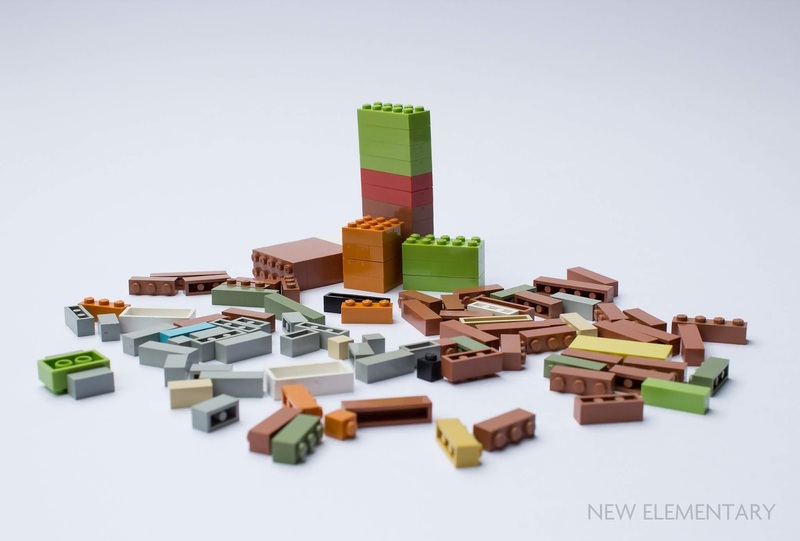 At the time there were some mixed feelings towards the post, primarily because Modulex is often thought of as incompatible with the LEGO System bricks we all know and love. More recently we came across Ralf Langer, a German builder who seems to have a real knack for integrating Modulex into his creations. Ralf was happy to offer some insight into his methods. I bought my first Modulex bricks back in June. I'm not quite sure why I finally decided to give it a try but most probably it was Terracotta, a nice muted earth tone. I really like using muted colours and the Modulex colour Terracotta is a tone that seems to be suitable for roofs or decorative strips for houses. Continuing our exploration of the smorgasbord of new elements from the LEGO® Unikitty™ series, it is time for an unusual element. Sven Franic investigates. 'Design Plate 4X4X2/3' or 'Plant Flower 4 x 4 Rounded Petals' as BrickLink call it (Design ID 35473) is a new element so far only available in Dark Pink [BL] / Bright Purple [TLG] (Element ID 6226524). Today it's the turn of the new textured half-cone called Roof 2x4x4 by TLG, and Tower Roof 2 x 4 x 4 Half Cone Shaped with Roof Tiles by BrickLink. 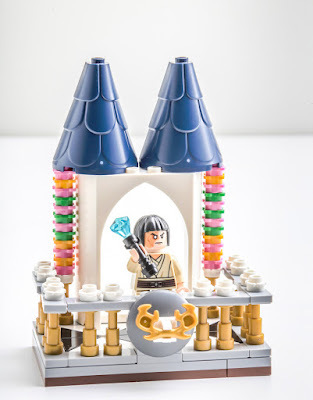 Its Design ID is 35563 and we had it in Earth Blue [TLG]/Dark Blue [BL] (Element ID 6209807) which you will find capping off two LEGO Disney Princess castles this year: 41152 Sleeping Beauty's Fairytale Castle and 41154 Cinderella's Dream Castle. It also comes in Dark Stone Grey [TLG]/Dark Bluish Gray [BL] (6230280) in two LEGO Harry Potter Wizarding World sets: 75953 Hogwarts Whomping Willow and 75954 Hogwarts Great Hall. 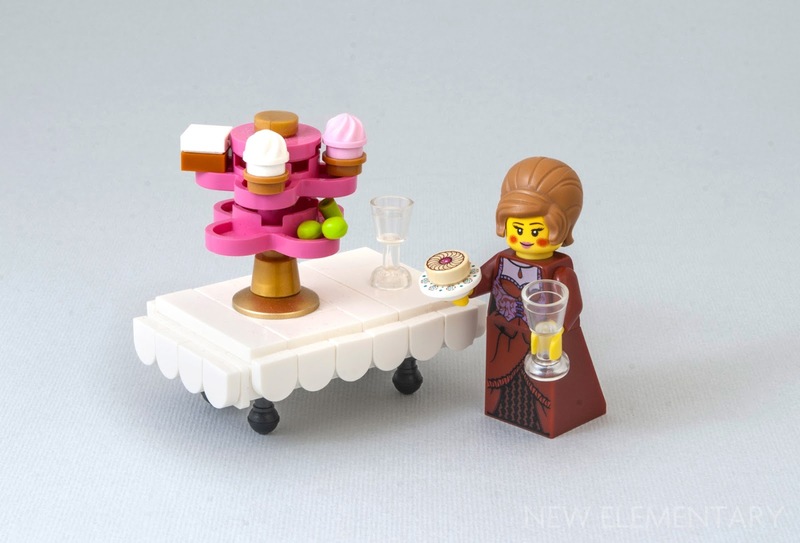 You'll also find it in Dark Red (6223601) in LEGO Juniors 10762 Belle's Story Time. The roof tiles on it are really quite beautiful I think. Petal-like and somewhat oversized, they do suggest other applications for the part – but what will our fan builders come up with? We sent a varied selection of new LEGO® parts from 2018 to some fan builders, and in an occasional ‘parts festival’ series we are showing you the techniques and models they came up with. For some four years I've been plugging away on a certain history-themed project, a key feature being the size of each build which I've restricted to a 16x16-module base. There's a large number of builds in the series and ideas have sometimes been hard to come by. So when the guys at New Elementary asked if I would like to play around with some new parts it spurred me on to build some new ideas and in the end the final model included each of the parts they gave me. The final model comprises includes various separate builds and there are three I want to focus on: a base, some flowers and a stained glass window.